My life is very different than it used to be. If you don’t believe in change…we should have a conversation, because my life is changed, its transformed, its altered, its been made over by one thing. There wasn’t some magic moment or something tramatic or dramatic that changed things. I made a decision (admission perhaps) that I wasn’t happy with how things were going and life needed to be different. Some of it was spiritual and some of it was my own decision to separate myself from others. Isn’t that what life comes down, a decision. A moment that you go one way or the other….the fork in the road….we choose Christ or not….we take the path that is well worn or the road not taken….we follow others or we go on our own….we says “YES” or “NO”. 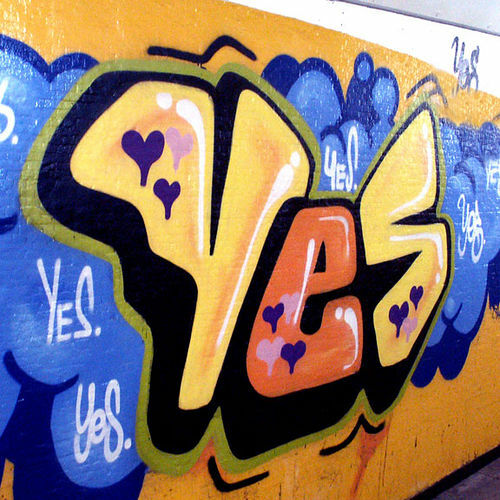 I am declaring this year to be my “YES” year, the year when I say Yes more often than saying NO. You are probably asking yourself, does she mean like that movie with Jim Carrey, Yes Man….sort of, but not. The meaning or reason behind my “Yes” decisions speaks more volume about my relationships with people and God than it does my work or my career. This is prompted by the realization that I spent a lot of time alone last winter, last year in general. I could chalk it up to being really busy with working out all the time, or living with a busy accountant or all the snow we had. However, I know….I KNOW…that I did not do my best not to be alone. Many Friday and Saturday nights, I spent in my sweat pants on my couch with my computer and watched movies or TV. (It is okay to do this once in a while, but when it becomes all you do, then you might be a hermit….it’s okay, I am not ashamed to admit that I was.) Not to say I was alone all the time, but my close friends and I didn’t make that effort to take advantage of our age or our city to enjoy life and be social. Tired or worn out, was always my excuse, but it’s amazing how much energy I have found inside these times with friends so far this year. So, this year, I am not making it a resolution or making it a goal, I am say “Heck yeah” to saying “Yes” and making a decision to live my life around other people and in community. I read this post on (in)courage and it prompted me to think differently about my friendships and community. If want those things, I can’t wait for them to happen to me, I have to take charge. That’s what I am doing. And so far this month has proved to be one of surprises and crazy opportunities. What is ironic about all these instances, is that each has prompted more opportunities to be around people and acquire new friends. Proving that saying “Yes” has a bit of a domino effect on your life. So what do you need to say “YES” to more often than saying “NO”? What are the ways you make being in community with others a priority? YES!!!!!!!! I love this post. Well written. Thanks for sharing. I'm excited to see what the Lord has in store for you as you continue to say yes to Him! Love you. So far, I feel like God is throwing things at me that I didn't expect. I haven't been able to pause long enough to process it all! This is awesome. Get it, girl. Can't wait to see what this year holds for you.